With its attractive holographic design and visually appealing choices of Holographic Gold, Iridescent White Holographic Red or Metallic Red color, this bow is a must have for your ceremony’s décor. They also make the perfect item to attach to giant gifts such as cars and homes. Measuring 25 inches in diameter, and with a magnet on the back to support its own weight, the bow is lined with a wire to retain that perfect shape. The bow comes pre-assembled, and you only need to fluff it up before it's good to go. With its impressive 43 inch size, wire based construction to preserve its shape, and a magnet at its back to support its weight, this bow is all you need for any ceremonial event, be it a grand opening or a groundbreaking. For ease of use, the bow has been pre-assembled, and all you need to do is fluff it up and it's good to go! 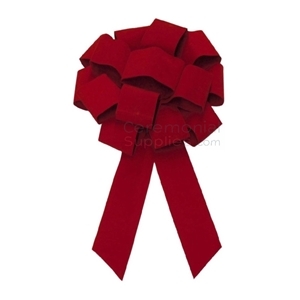 The Giant Red Velvet Ceremonial Bow measures 43 inches in diameter. It has a magnet on the back to support its weight. These bow is pre-assembled involving minimum work and it is lined with wire to help keep the perfect shape. 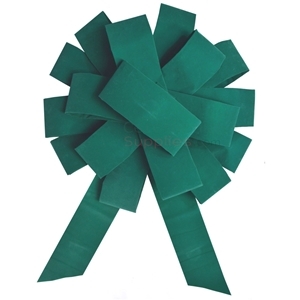 With options of 8 inches or 14 inches, On the Go Ceremonial Ribbon Cutting Pull Bows are easy-to-use decorative bows for ribbon cuttings, grand openings, groundbreakings and any other ceremonial event that calls for festive decor. The extremely convenient ingenuity of these bows is what makes them a must-have. The bow comes unassembled in a flat package. The magic happens when you withdraw the flat bow from the package and pull on a string that brings a fluffed up bow together in a matter of seconds. A perfectly shaped bow with minimal effort. 8” Pull Bow comes in gold, silver, royal blue, white, green, orange, red, black, turquoise, fuchsia, burgundy, lavender, lime green, brown, navy, light blue, yellow, and purple. The giant ceremonial event bow is available in three color options: Gold, Silver, Light Blue, Light Pink and Hot Pink. The bow measures 25 inches in diameter and has a magnet on the back to support its weight (perfect when used as a car bow!). These pre-assembled bows are lined with wire to help it maintain its full shape. Looking for the perfect giant grand opening bow to decorate for your ribbon cutting ceremony? Giant grand opening bows are more than a novelty item. Grand openings benefit greatly from oversized accessories and decorations because they highlight the grandiosity of the event. A giant grand opening bow adds to that emphasis by adorning the ribbon cutting stage with the pizazz of a well wrapped present. It is symbolic to the event as grand openings mark the beginning of something new, as when you break the ribbon on a gift that you excitedly look forward to unwrapping. The big bow is that decoration that makes that gift all the more appealing. It says someone wrapped with thought and care; just as you intend when you plan a grand opening. If you are familiar with ribbon cuttings, you know that it is customary to use giant scissors to cut an extra wide ribbon as part of the ceremony. It only makes sense that any other decorations used are just as prominent. Giant grand opening bows perfectly complement the wide ribbon as decorations. Your grand opening will look like a gift to the world, and that is exactly how your audience should feel about your event if it all goes according to plan. Ribbon cuttings are known for their celebratory nature; decorative bows are consistent with that mood, which is why they are the perfect accessory to go along with the theme. 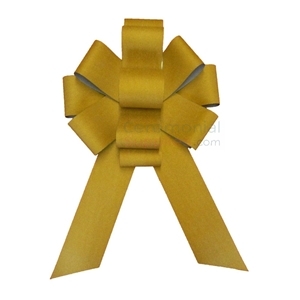 CeremonialSupplies.com features extraordinary giant bows that no grand ceremony can go without. You want to impress and you want to be remembered for your ability to do so. A grand opening is your first chance to create a public image that people will be attracted to, so your decorations need to be consistent with the quality you want to be known for. Our big bows are exemplary of quality and splendor, so any event, even beyond ribbon cuttings, will be significantly enhanced by them. Your event pictures will look lovely and attendees will remember with pleasant thoughts. Our bows’ color options cover the most popular requests to match just about any company’s color schemes-red, blue, green, gold, silver, pink, white and many more. Giant bows have multiple uses. Although our focus is to help you put together the best grand opening ceremony you possibly can, consider the many uses that you could have for a giant grand opening bow. These bows are designed no different than a gift bow—like the ones used in presents—with the exception that they are many times bigger than the average present ornament. 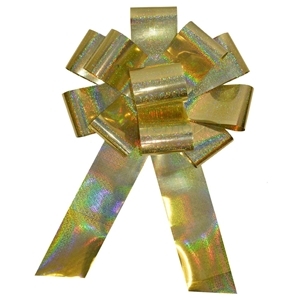 This makes our giant grand opening bows ideal for huge gifts. Giving away a car, a house or anything significant enough to require and enormous gift bow? Any of the products in our collection of oversized bows will work just fine. CeremonialSupplies.com is your standard of excellence when it comes to grand opening supplies. Take your pick from our elegant giant bows to couple with any other ceremonial product from our grand opening collection or simply use it as an adornment for a gift that’s worth a thousand words. Regardless of your need, we are happy to help you through every step of the way. 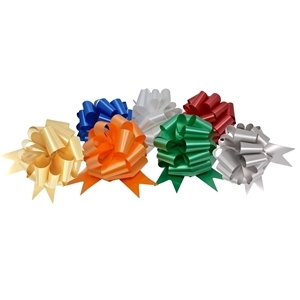 Call us or e-mail info@ceremonialsupplies.com if you need assistance with any of the bows on our website. Copyright © 2019 Ceremonial Supplies. All rights reserved.